Today I would like to introduce a unique coffee shop chain, “Komeda” . The Komeda chain was established in 1968 and has the largest number of shops in Chukyo region, which includes Nagoya city. They opened many shops in Tokyo as well, and lately Komeda been quite topical among my friends living in Tokyo. Komeda offers many significant services, and the most unique one is their “morning” menu. If you order a cup of coffee before 11:00 am, a slice of toast and an boiled egg come with it. By the way, coffee shops in Nagoya area often have this kind of “morning” menu, and you can have breakfast (sometimes an astounding variety of foods is available) for the modest price of a cup of coffee. OK. Let’s talk some more about the reasons why Komeda is so special. – Long shop hours (7:00am-11:00pm) / open throughout the year. 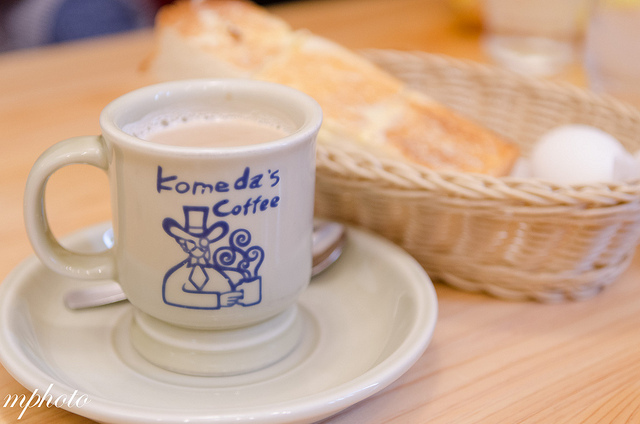 When you find a Komeda coffee shop somewhere in Japan, you’d better stop by before 11:00 am and sample the morning menu! And please share your experience with me (because I’ve never visited Komeda 😉 ). Amazing 3D Image Hidden Puzzle for Nintendo DSi! !